This is a Sidewall. It was designed by Marthe Armitage and printed by Marthe Armitage. It is dated 2004 and we acquired it in 2005. Its medium is linoleum block-printed on paper. It is a part of the Wallcoverings department. 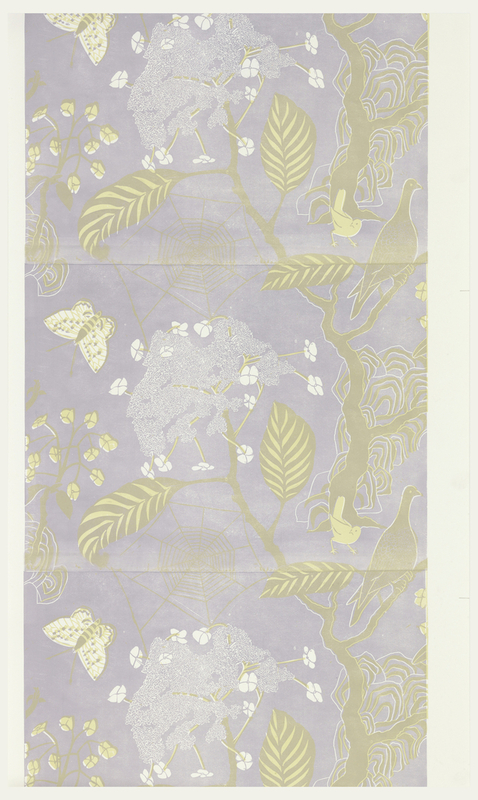 Cobwebs was designed and printed by Marthe Armitage of Chiswick, England. The paper is graphically strong but is printed in muted colors, Armitage’s preferred color palette. The paper was printed by linoleum block on a manual offset lithographic printing press. Armitage attended the Chelsea School of Art in the 1940s and was Master of the Art Workers’ Guild in 1993. The Art Workers’ Guild is a society of artists, craftsmen and designers founded in the 1890s, whose past Masters have included Walter Crane, William Morris, and C. F. A. Voysey. She was inspired by William Morris, A. W. N. Pugin, and Edward Bawden. The flatness of her designs is especially reminiscent of Pugin and Bawden. Great Britain is a leader in the innovative design of contemporary wallcoverings and it is important to represent this body of work in our collection. We have a growing collection of papers by contemporary British designers and this piece would help to better fully represent the variety of work being done. This object was donated by Marthe Armitage. It is credited Gift of Marthe Armitage.